The Perseids are one of the most prolific and best-known of the meteor showers and can be seen in late July and through August each year, with the maximum activity on or around 12/13 August. One advantage of the Perseids shower is that it happens in the warmer weather of Summer, which makes it ideal for anyone interested in seeing their first meteor. You can see a meteor at any time of year but, for a day or so around the date of maximum, there may be a ten times better chance of seeing one. Because of the effect of perspective, meteors in a shower appear to come from a particular area of the sky. We call this area the radiant. 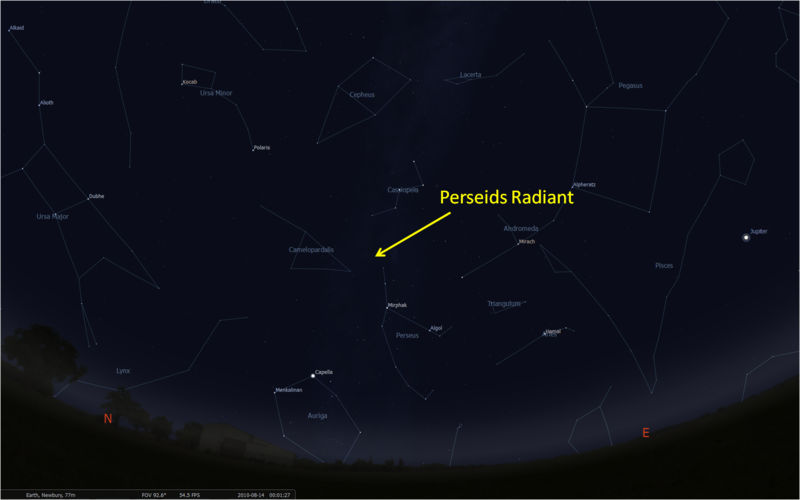 The Perseid radiant is in the constellation of Perseus, just below the familiar ‘W’ of the constellation of Cassiopeia. In August this can be seen reasonably high in the north-eastern sky later in the evening. The best direction to look for Perseids some say, is generally in the direction of the Square of Pegasus or the Plough (or Big Dipper) however, meteors appear randomly all over the sky so there really isn’t a particular direction you need to be looking in. Just look up and try to fill your gaze with sky. A dark location away from lights will help. This year there is the absence of a bright moon, so seeing meteors will be more easy, but it all depends on your local conditions – if it is very hazy and there is light pollution you may have a better chance to see meteors overhead than lower down. Lets hope the skies are clear and the clouds stay away. Some meteoroids originate from material ejected by comets as they pass through the inner solar system. The Perseids were the first meteor shower to be connected with a comet when astronomer Giovanni Schiaparelli noted the similarity between their orbit and that of Comet Swift-Tuttle which was observed in 1862. Swift-Tuttle orbits the Sun about every 135 years. Its last perihelion (the point where it is closest to the Sun) was in 1992 and the next is in 2126. The debris trail is thickest nearer the comet, so the Perseids were highly active in the early 1990s with several hundred meteors per hour at the annual maximum. As the Earth crosses Swift-Tuttle’s orbit it sweeps up some of the debris released by the comet on previous orbits. This burns up in the atmosphere as a meteor, but the particles in the Perseids are much too small to reach the ground as a meteorite. 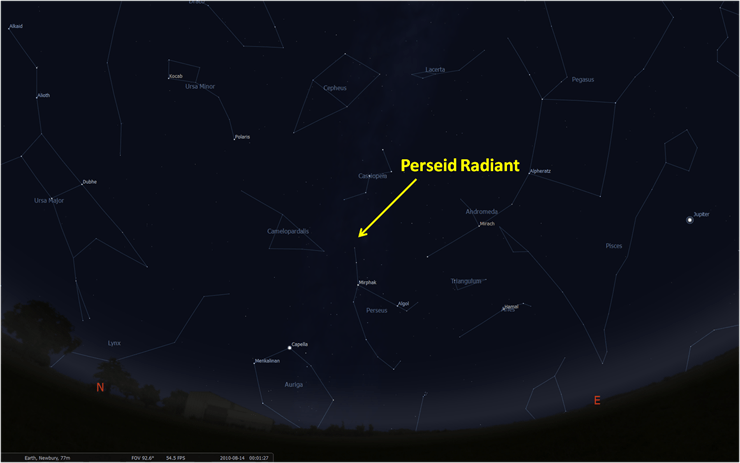 Even in quiet years the Perseid rate can exceed 100 meteors per hour at maximum, as seen from a dark site and with the radiant high in the sky. The rate tends to be highest towards dawn when the observer is on the side of the Earth moving directly into the trail of comet debris. Perseid meteors tend to be brighter than most, so the shower is ideal for anyone wishing to see their first ‘shooting star’. An observer watching the early morning skies will almost certainly see several over a period of, say, 30 minutes. The density of the trail does vary so the number of meteors can change in a matter of hours. For that reason it is always worth watching a few days or week or so either side of maximum. It also pays to treat predicted rates with caution because they refer to ideal conditions; a hazy summer evening with light pollution can obscure the fainter meteors and dramatically reduce the numbers you will see. Fortunately the Perseids tend to have quite a lot of bright meteors so there is still a very good chance of seeing some this year. How come some look like comets & are very low & others are very high bright lines, that continue? I am in the South-West. I understand best chance is 10.00pm ish to Dawn, but what direction. I seem to be reading North-East and at a very dark place..
I’d like to watch it. I am in North Kent. Where is the best place to be? I hope it will be a dry night. Hi, what are the faint slow moving objects that occasionally burn bright, then go faint again, and have no trail? Are they a different type of meteor or something else? Unfortunately there is no trailer for meteorwatch this year as it would be pretty much the same as the previous years.